Prior, I published a belief that depression in some cases was a manifestation of chronic pain for which ketamine could temporarily block. In this 21 page article they make clear connections between brain cytokine inflammation especially TNF (Tumor Necrosis Factor), chronic pain, and depression. The Hippocampus seems to be the center of much of this. Treatments directed against brain inflammation include antidepressants and interspinal entanercept. Poor sleep prevents clearance of inflammatory compounds from brain. Exercise is an anti-inflammatory. Sensitized Glial cell in the hippocampus generate these chamicals. 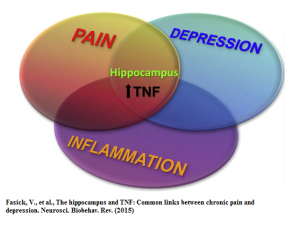 The hippocampus and TNF: Common links between chronic pain and depression. Fasick V(1), Spengler RN(2), Samankan S(1), Nader ND(3), Ignatowski TA(4). 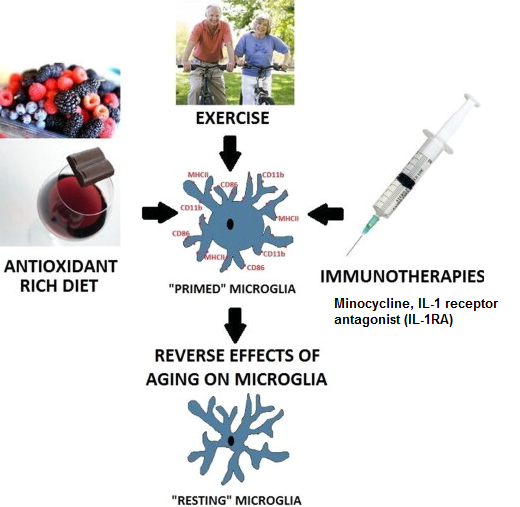 Damage induced by high glucocorticoid levels may stimulate cytokine/TNF production. Depression is associated with Hippocampal damage and scrinkage. Sadly, It misses the pro-inflammatory consequences of inadequate sleep. Elderly, with sleep disordered breathing, suffer cognitive decline and need attention with sleep apnea measures. This entry was posted in Depression, pain mechanisms, Uncategorized. Bookmark the permalink.